Business blogs have the potential to increase website traffic, build trust and thought leadership within your industry and drive online lead generation. 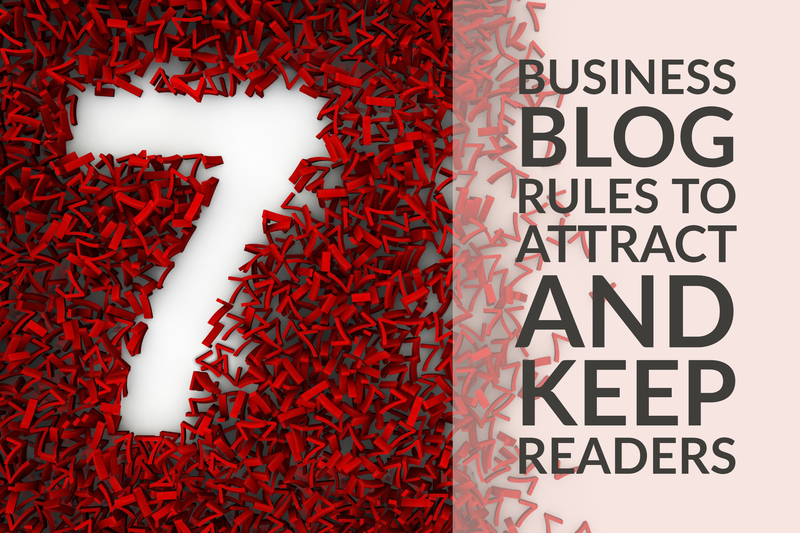 But before they can accomplish those goals, business blogs must attract and keep readers. Attracting and keeping readers means paying attention to the details that optimize your business blog for both readers and search engines. Follow the 7 rules outlined here to improve your business blog strategy and implementation. While the ultimate goal of your business blog may be to increase sales, through content marketing, inbound lead generation, and brand awareness, the goal of each individual post should be to help your readers (aka prospects and customers) solve a problem. Business blogs are most effective when they are useful to the target audience, sharing information such as lists of resources, step-by-step illustrated how-to articles, or insights about industry changes. 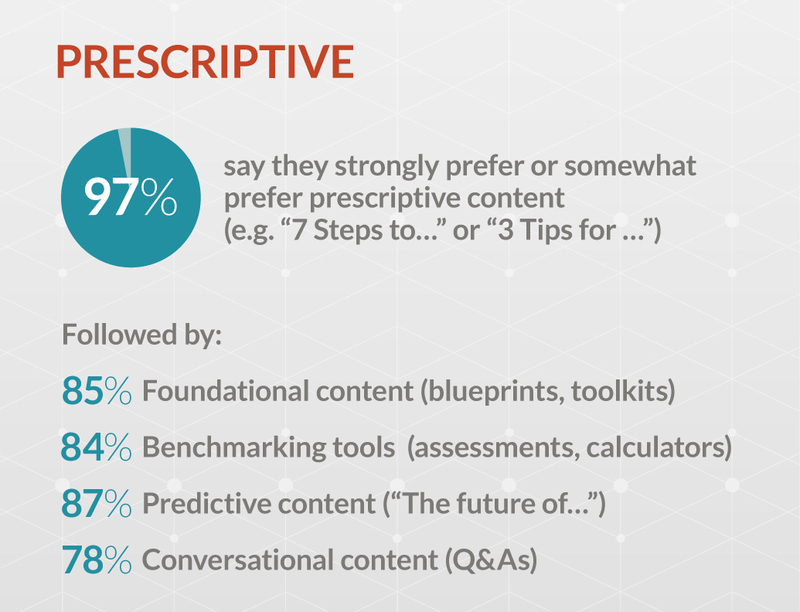 Nearly all respondents to a 2017 DemandGen survey (97 percent, in fact) said they strongly prefer or somewhat prefer prescriptive content — blog articles such as “7 Steps to …” or “3 Tips for …”. Great marketing content — including business blog posts — often tells a story or provides a character for readers to root for. Even in the business world, it helps to provide entertainment as well as information. Ways of drawing readers in to content with a story include sharing customer success stories or incorporating a Q&A style of blog post. Facts and figures matter. Backing up your articles with useful statistics, either found in research through third-party sources or by doing your own original research, lends your business blog posts greater authority with readers. We’ve seen this at work first hand. Our most popular LinkedIn article is this: 53 Facts & Stats About Video Marketing. And our client West has seen tremendous success through its use of original research and survey data to develop marketing and thought leadership content for the healthcare technology and patient communications industry. Check out this Q&A on how those statistics and data play a role in successful placement of contributed articles: Q&A: How JONES &West Use Contributed Articles In Marketing Campaigns. 4. Make it visually appealing. With the options for consuming content nearly limitless, your readers aren’t going to stick around long if your business blog isn’t visually appealing. Regardless of the strength of what you write, if reading it is difficult due to design flaws, too-small type, too-long blocks of text, or a lack of guiding visuals, you will lose readers. It just makes sense to break up and complement your text with headlines and subheads, images, bulleted lists, highlighted quotes, and other design tactics that enhance the reader’s experience. There are more tips on reader-friendly formatting here: Optimize Your Blog For Greater Reader Usability. Of course, not everyone wants to read. In fact, that same DemandGen survey cited above revealed that more than a third of B2B buyers prefer audio or video content that can accessed on demand. Consider creating some of your blog post content as videos. 5. Include links for deeper engagement. Once you have a reader hooked, help them stay engaged with your blog, your content and your brand by including additional links in your blog posts. Including links to additional, related resources — other blog posts, downloadable assets, and content elsewhere on your website — can increase the amount of time readers (also known as prospects or leads) spend on your site. It enhances your position as a source of reliable information. And don’t forget to include links to authoritative outside websites that provide additional information or that you have used as source for your blog writing. Search engines often interpret those links as a sign of reliability from your site when you have linked to trusted sites. The links you include can range from simply hyperlinking a single word to a related blog post to including lists of “additional reading” resources as I have several times in this post. It all goes back to providing useful information to your readers, which keeps them coming back to you for more. 6. Write a meta description that answers search questions. I promised these rules would be about attracting and keeping readers. One way of attracting readers is to directly promote your business blog and individual posts through a range of tactics (6 Signs Your Blog Promotion Is Lacking). But beyond promotion, there are steps you can take within the structure of your business blog itself that will increase how many readers you attract. One of those steps is to write strong meta descriptions focused on the ways web searches are conducted today. Increasingly, those searches are conducted by voice, and quite often both voice and typed searches are in the form of a question: How can I ______? What is the best _____? Writing meta descriptions and rich snippets that answer the question your blog post answers can make it more search-friendly, whether by triggering a voice response that answers the question or by providing an appealing listing in the search engine results that your prospects are more likely to click. 7. Make it about the reader, not about you. Maybe I’ve already said this before points 1 and 2 (solve a problem and tell a story), but just in case you’ve missed the point, I’ll say it again. Your business blog should be all about your business. It should not be a listing of your products and services. It shouldn’t be all about how great you are. It should not be just another advertisement or asking for a sale. Remember to write your business blog for your reader. Write about the things your reader (aka your prospect or your customer) wants to know on which you are an authority. It’s OK to occasionally share something about your business and your own growth and success from time to time, but even better to share something about your customers — the people your readers can relate to. That is what keeps them coming back. Are you ready to take a closer look at your current business blog to see how well you are following these rules? Download our Business Blog Essentials Checklist for tips on content, formatting and SEO that help readers find your posts and keep them coming back for more.